Browse > Home / Arts, Education, Entertainment, Fundraising, Headlines, Life / Enter to win two FREE tickets to the Mar. 6-7 Poverty Bay Wine Festival! Enter to win two FREE tickets to the Mar. 6-7 Poverty Bay Wine Festival! 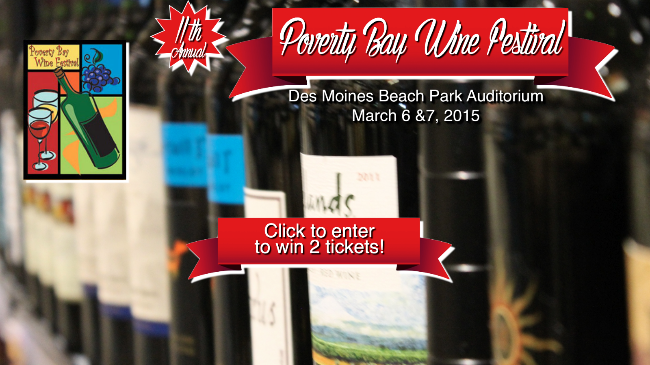 You are invited to the 11th Annual Poverty Bay Wine Festival, coming to Des Moines Beach Park Auditorium on March 6-7! To purchase tickets, click here and save $5 with special early bird pricing. Click to purchase Early Bird Tickets & save! The Des Moines Rotary Club invites you help us celebrate the 11th annual Poverty Bay Wine Festival as we return to our original location in the newly remodeled historic Des Moines Beach Park Auditorium. This is your chance to get close and personal with renowned local winemakers from over twenty of Washington State’s finest wineries. The wine tastings will be flowing and bottles of your favorites will be available at special Poverty Bay Wine Festival prices. We will have a lively atmosphere with entertainers and strolling musicians, but this year’s event will be all about the wine, with a wine tasting competition, a wine toss and a more relaxed atmosphere for meeting and learning from some of the best winemakers around. As always, 100% of the net revenues generated by this event are used to fund the charitable activities of the Des Moines Rotary Club. Free parking and a free shuttle service will run from the Des Moines Marina to the Wine Festival both days. Must be 21 or over to attend. Please bring your IDs as IDs will be checked at the door.